On February 16th, 1947, the National Commander of the Civil Air Patrol (CAP), Col. Earle L. Johnson, who was 52 years old, took off from Cleveland Municipal (now Hopkins) Airport at 12:10 p.m. in C-45F “Expeditor” tail number 44-87127, accompanied by his crew chief, SSgt. Kenneth F. Wood, who was 25 years old, and a United States Marine, traveling on a space available basis, Pvt. Edward J. Malovic, who was only 17 years old. Both Col. Johnson and Pvt. Malovic were raised in Northeast Ohio, and sadly they would both lose their lives here. About six minutes later, while flying over the North Royalton area at about 400 feet altitude, the plane was seen to be trailing smoke. The aircraft then turned back or spiraled back toward the Airport, descended, and impacted the ground before bouncing back up, and exploding. All three military members on board the aircraft were killed and debris was scattered over a large area. After investigation it was determined that a fire likely started in the back of the right engine, spread through the wing to the fuselage, causing a loss of control and eventual crash. This was one of two crash sites (well, we're still researching and looking for others in Ohio) that we planned to visit this year while on vacation there. This crash site is on private property and we searched it with permission from the property owner on the afternoon of Saturday, June 25th, 2016 since we are sharing all our research with him. In the end, mainly due to poison ivy (which was everywhere!) we only found a few items, but enough to confirm we had the right location. I am holding back a lot of the research that led to the discovery of the exact location of the crash site (photos on my Flickr page likely reveal that location now) but the research I had to do was on multiple levels, but it was research I accomplished rather quickly. Unlike other Ohio sites that I've been researching for years, from me initially finding out about the crash until we actually located it was only six months. We also tried out some new urban camouflage which, if I do say so myself, worked rather well. Nice find Jeff, thanks for sharing. Surprised you were able to find anything with all that growth. I agree, this is a nice find. It looks like the plane got destroyed pretty badly- that and the fact that it is so close to a road makes me surprised that so many parts could be found. Thanks for sharing! Thanks for the positive comments everyone. I just added another photo to the album today too, the last one. Pvt. Edward J. Malovic USMC was buried locally in Cleveland, and since we knew from his findagrave page where exactly he was at, we went out to clean it up and get a photo of it. Interestingly his findagrave page doesn't have a photo of his grave on it, but does have other information about him. The research on this crash site sort of tugged at my heartstrings a bit since my son is nearly the same age Pvt. Malovic was when he died in the crash. We have an appointment to visit another crash site on private property this Thursday, I will post a new thread with the information I find out there. Just an FYI for anyone else on the board reading this, Ed e-mailed me today and we're in contact with each other now. His dad was Edward's little brother who was only 4 or 5 when Edward died in the crash. Here is a photo of United States Marine Corps Pvt. 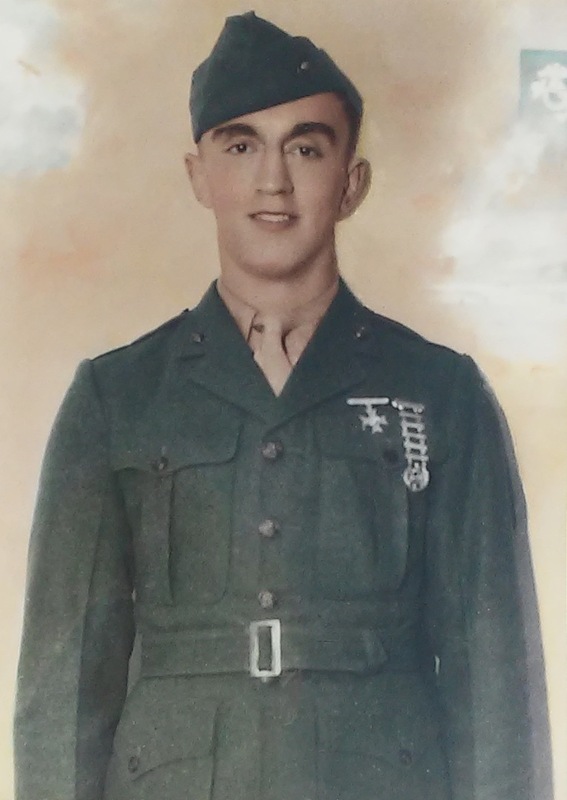 Edward J. Malovic, provided by Edward (Ed) N. Malovic, who is the son of Pvt. Malovic's younger brother Stephen who was only 4 years old when his older brother was killed in the crash. Ed (who was named after his uncle by his father Stephen) and I talked on the phone for awhile and he told me that nobody in the family ever really talked about what happened, but due to the research my son and I did, we were able to answer a few questions that he had, and hopefully he can make a visit to the crash site with us once we're back in the Cleveland area. We are also going to be sharing all our research with him. This is only the second time we've been in contact with the family of someone lost in one of the aviation accidents my son and I have researched. Great find guys! Always nice to have an interested/cooperative property owner. Thanks for posting the detailed information on this crash. Col. Johnson was my second cousin 2X removed, information I only just found out about while working on my families geneology. Thanks for the message, interestingly earlier this week I was contacted by the daughter of the crew chief's best friend growing up. The crew chief and her dad grew up in Pennsylvania, although sadly her dad passed away the year before my son and I found out about and located this accident. She had mentioned maybe installing an Ohio Historical Marker, I'm a bit remote for that being in California, but it's a good idea. I was recently interviewed by a local reporter about this accident and when I was in Ohio earlier this month, Paxton and I led some people to the crash site while we were there on vacation this year, but it was an impromptu site visit, I hope to have a more official visit some time when the plant life isn't as abundant. After leading the people to the crash site, Paxton and I gave a brief talk to the local historical society about the accident and talked about those who died there. Hopefully the momentum to get a historical marker installed will continue.